Tuesday • April 8 • 2014 Volume 81 • Number 14 INSIDE: Menards n Bomgaars n Employment n Dining n Presorted Standard US Postage Paid Permit #8 ECRWSS Vermillion, SD Walmart n One In A VerMillion n bp Broadcaster Press Postal Patron Local Since 1934 201 W. Cherry n Vermillion, SD 57069 n Phone: 605-624-4429 n Fax: 605-624-2696 n www.broadcasteronline.com Gear Upfor TURKEY SEASON On Sale Now! Grow Big Bucks AND Keep Them on Your Land! 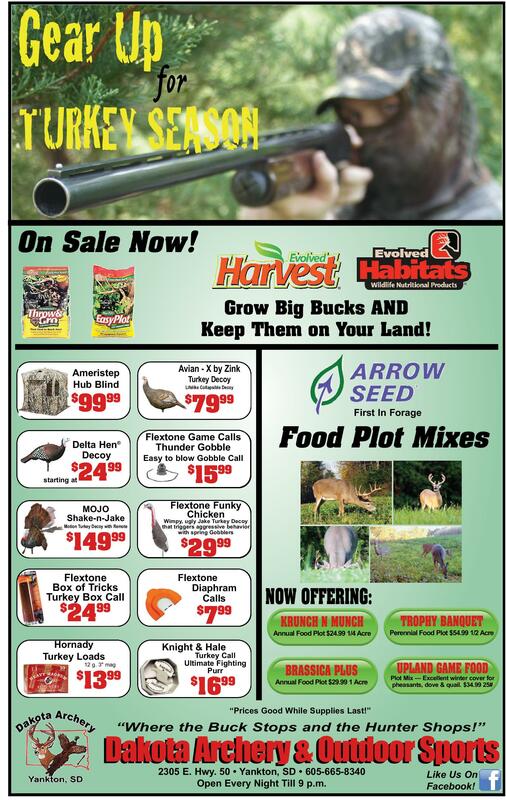 Ameristep Hub Blind $ 9999 Delta Hen® Decoy $ starting at 99 24 MOJO Shake-n-Jake Motion Turkey Decoy with Remote $ 14999 Flextone Box of Tricks Turkey Box Call $ 99 24 Avian - X by Zink Turkey Decoy Lifelike Collapsible Decoy $ 7999 First In Forage Flextone Game Calls Jake® Thunder Gobble Gobble Call Easy to blow Gobble Call Food Plot Mixes $$ 1899 1599 Flextone Funky Mossback Three varieties: Chicken Wimpy, ugly Jake Turkey Decoy Black Walnut, Cherrywood, that triggers aggressive behavior Slate, Glass & Chrystal with spring Gobblers % 99 20 29 $ AMERICAN MADE Flextone Flextone Diaphram Calls Diaphram $ Calls 99 7 $ 99 7 NOW OFFERING: Hornady Turkey Loads TROPHY BANQUET Perennial Food Plot $54.99 1/2 Acre Knight & Hale 12 g. 3" mag $ KRUNCH N MUNCH Annual Food Plot $24.99 1/4 Acre 99 13 Turkey Call Ultimate Fighting Purr $ 1699 BRASSICA PLUS Annual Food Plot $29.99 1 Acre UPLAND GAME FOOD Plot Mix — Excellent winter cover for pheasants, dove & quail. $34.99 25# “Prices Good While Supplies Last!” “Where the Buck Stops and the Hunter Shops!” Dakota Archery & Outdoor Sports 2305 E. Hwy. 50 • Yankton, SD • 605-665-8340 Open Every Night Till 9 p.m. Home of Great Ideas since 1934 B ig Ch a n ges a re co m in g We’re our to H a tch Fu rn itu re... entire remodelingthe store with www.hatchfurniture.com 201 W Cherry St. • Vermillion, SD Phone: 624-4429 • Fax: 624-2696 BroadcasterOnline.com Like Us On Facebook! FURNITURE &FLOORING 109 East Third, Yankton 605-665-4416 • 800-798-4663 M-F 10-6, Sat. 10-5, • Evenings by Appointment experience of a world famous designer. Come in now for 50% and more off furniture and accessories.